6. You will need to place these two values into PeopleVine. 7. Also make sure you are not in test mode. If you're in test mode, you will see a bar across the top of your screen. Now head over to PeopleVine. When logged in, click on your company name in the top left. Select the type of payments you accept. 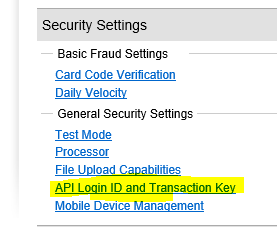 If you've enabled ACH with Authorize.net and your Merchant, we do accept that for payments in the transaction engine. You are now ready to accept payments in PeopleVine.